Sorry to again be critical, Jarrett. But your presentation does not adapt to the local environment of Winnipeg or Canada in general. You continue to tell cities that they must choose between ridership or coverage, while ignoring the great equality most Canadian cities have in transit planning, by having good minimum service and coverage guidelines. These guidelines ensure an attractive, minimum transit service is available to everyone, while seeing higher service levels on main corridors. Due to these guidelines, you do not see the troubles the USA has with people being cut off from jobs, education, and other services. You do not see transit being used only by the poor, because transit serves everyone, etc. You do not see middle class people saying they don’t want to pay for transit, because they don’t get any in their neighborhood. You still have failed to say why the Canadian way of ensuring a good, minimum level of service to all is a bad idea, and why this should be scrapped for your ridership verses coverage idea. Or why transit agencies should not be funded properly, to allow both ridership and coverage. Canadian cities have vastly higher ridership levels than American and Australian cities. So clearly ridership is not suffering. In fact it makes sense a city that provides high quality transit service to everyone is going to have better ridership. It also seems very counterintuitive to tell cities they should actually make transit worse in certain neighborhoods, because those neighborhoods do not match some planning ideology for optimal density and land use patterns. Again, the great ridership results of Canadian cities, comes by the fact that all areas get pretty good transit, regardless of their density levels or built form. There is a reason Winnipeg has almost double the transit usage rates of Portland and other American cities. And it is partly because everyone can rely on the system, regardless of where they live in Winnipeg. So what do you think is so unique about Canadian cities that allows them, but not American cities, to have both high coverage and high ridership? Canadian cities have historically funded transit to ensure that there is a basic level of service available in all parts of the urbanized area, within a specific walk of a certain percentage of dwellings. Once that basic coverage is in place, then additional resources are put into main corridors and other high ridership routes. However, that basic coverage to all areas, creates the ridership, because everyone can access transit and get to where they are going. Good levels of service are also generally applied to all areas, regardless of housing type or density. This makes transit a viable option for many residents, including those with other options. Ensuring a cross section of the population utilizes transit, and that people feel transit is an essential part of their community. Most US cities have never had a minimum coverage requirement like Canadian cities have. This is why job access by transit is so hard in many American metro areas, and why most residents don’t have access to transit. Because transit is mostly focused on serving areas with poverty, except for legacy systems like NYC. This type of planning also sees lower density areas, or more middle class areas receive much lower levels of transit service, which in turn does not attract riders. Jarrett talks about how some outlying areas of cities like Winnipeg should understand they cannot have good transit, because the residents choose to live in single family houses, or the density is not super high. Well does Jarrett know that some outlying areas of Winnipeg, home to nothing but low density housing, support 5 minute rush hour bus service? You cannot apply one planning idea to all cities, or in different countries. 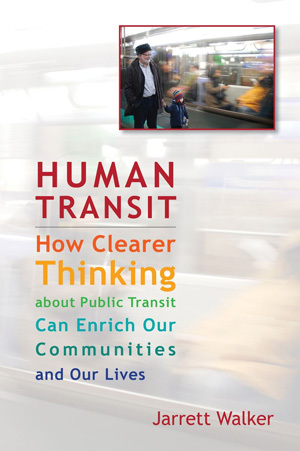 There are different cultural attitudes and practices towards transit that have to be understood. Look at Edmonton, where planners there are cutting routes, on the advice of Jarrett, to outlying areas. Residents are up in arms, and people are being stranded, including people who really need access to transit. This is going to create a situation where people in those outlying areas are going to start questioning why they are paying taxes to support transit, when the transit system has decided they don’t even deserve the minimum level of service (or that minimum equitable level of transit service) to have basic mobility. We also saw this in Fredericton, where again Jarrett advised them to cut service to outlying areas. Only in this case, the residents created such a stir that the planners backed off, and reinstated some service. And finally, we saw it in Halifax, where again, planners were going off Jarrett’s idea of cutting service to outlying areas. The same thing happened, residents up in arms, and ride the bus days were created to save the bus routes. The minimum level of service guidelines are a hallmark of Canadian transit networks, and create an equitable high ridership system. Canadian cities have double the ridership levels of American cities, so I guess we are doing something right? So maybe Jarrett should be tailoring his ideas to the different planning practices in different countries. Maybe his message in Winnipeg should be that routes need to be streamlined to reduce all the long circuitious routings and duplication. While still working to ensure a good quality of transit service is provided to all areas of the city.